Kristen Crain, 17, says she began mushing in 1997 “because of my dad.” She’s run the Jr. Iditarod twice. A senior at Su Valley High School, she participates in band and the Battle of the books. She participates in band and Battle of the Books. Kristen says she enjoys the mountain dulcimer, the viola and reading. 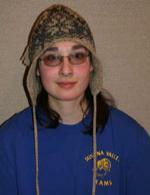 She plans to go to UAA and hopes to continue mushing after college.